Don’t Breathe is a movie that will keep you holding your breathe and claustrophobic with it’s seamless cinematography and sound effects. 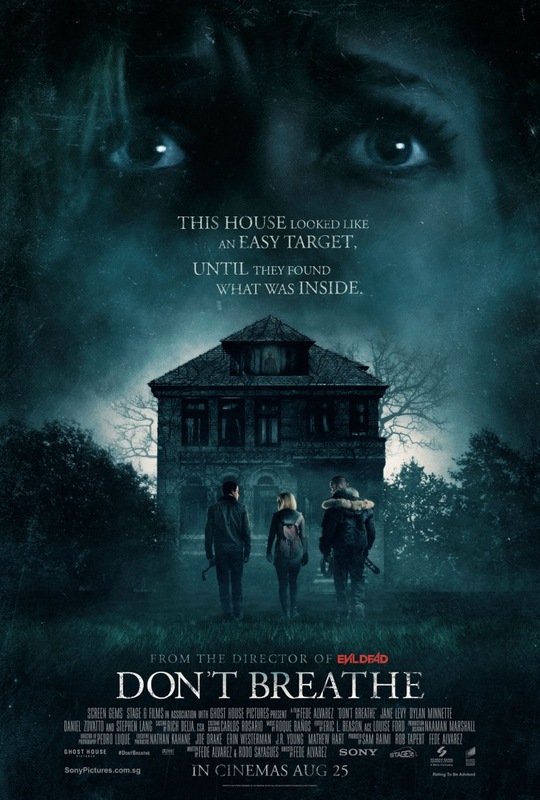 With 90% of the film taken place within a house, the director brought the suspense up by another level with the tracking shots, long takes, night-vision format and manipulated of our sense of orientation to “stop our heart” with the jump scares. To be honest, I spent a large portion of my time shaking my head in the cinema. I couldn’t help mumbling “this is stupid” from the moment the trio tried (a little too hard) to break into the highly secured house without bring discrete. Yes, the plot might says that thieves were teens, but Alex (Dylan Minnette), Rocky (Jane Levy) and Money (Daniel Zovatto) seriously don’t look young enough (they look like they are in their late twenties and Money early thirties) to be THAT brainless. While I like how the director brought out their personalities and roles through a simple and concise successful break-in, the half-baked character background was insufficient to make me empathize with any of them throughout the film. Why? A robbery was wrong from the start! While I love Lang’s demented performance with minimal lines, I couldn’t help but feel that the characters were just chess pieces for the director to play within the confines of a house. There were little character development and I was on the verge of spouting vulgarities when the invaders paused or made unnecessary noises in a particular way to attract predictable attacks and tension. The trio behaved in manners where you know they would either be caught or killed just seconds before they were caught or killed (Think taking pity on someone else when your own life is at stake; taking own sweet time to smile and finding the right keys; taking time to taunt the blind man when you’ve escaped etc). Weak motivations aside, I prefer this anytime over Evil Dead, so if you love an intense -heart-stopping thriller without looking deep into the plot, this is a perfect movie to watch with your partner. In the scene which took place in the dark, the actors wore lenses that made them look like they had dilated pupils but also greatly restricted their vision. Stephen Lang wore contact lenses that greatly restricted his vision, particularly in low light and he only has about 13 lines of dialogue in the whole movie. Director / Writer Fede Alvarez, Writer Rodo Sayagues, Producers Sam Raimi & Rob Tapert, Composer Roque Baños, and actress Jane Levy all worked on Evil Dead (2013) before this movie. Check out Don’t Breathe Official Website and Facebook Page! Don’t Breathe is out in cinemas on 25th August 2016. *Disclosure: Invitation from Sony Pictures Singapore. No monetary compensation was received for the movie review. OMG! I am reading this post past midnight. So scared! Dared not click the videos. I’ve only seen the trailer and I got interested, I thought it was pretty cool and intense. I wonder how it all ends though, so I would definitely go see the movie. I hope it’s worth watching. Awww, reading your comment made me think twice on watching the movie. But I’ll still try to check it out. Hahaha… I totally relate to it. Horror movies mostly have a loose plot and the way the supernatural thing behaves is also so playful!!! I rated this one much higher than you did. I will post my review on the next thread. I liked the suspense very much. I liked the performances of Levy and Lang very much. Love your review Tiffany! Haha I am a big fan of horror flicks and this one from the get go isn’t worth my damn time. Can you please do a review of Train to Busan? Thank you. My Train to Busan review is already out! You can go check it out! Definitely not my thing to watch. Oh God.. the more older I get the more I stay away from horror movies. Even this review can give me a sleepless night or two!